• Peel and chop potato and carrot (I actually don't peel them anymore) and boil them in 1 c. water. • Meanwhile, place all other ingredients in a blender. 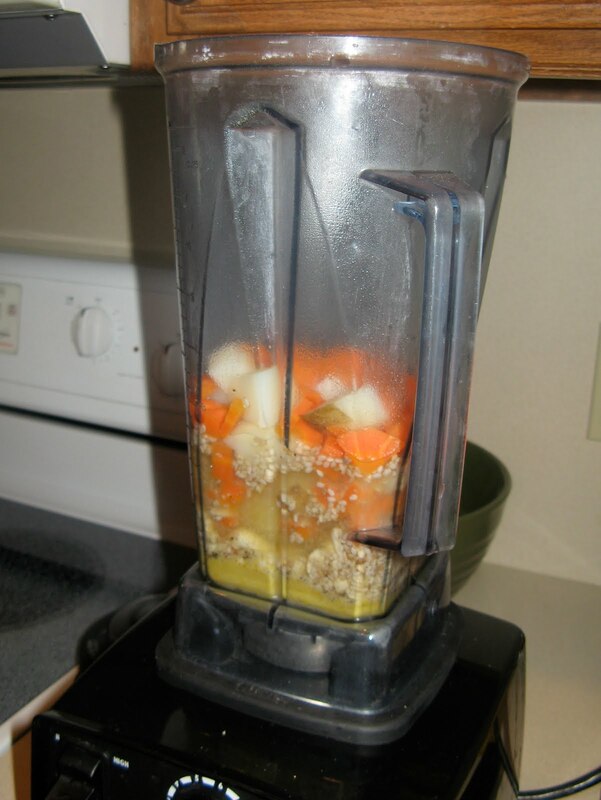 • When the potatoes and carrots are tender, add them, with their water, to the blender. Note: Marian and I once used white beans instead of a potato. I've also substituted leftover butternut squash for the carrot. Both worked great. Sounds interesting. I'm curious why you try to avoid any fat. It seems like if you're avoiding all meat and dairy, your body would need some fat, especially for children. the original recipe for this calls for 1/3 c. earth balance. i just omitted it from the recipe here, but this last time i made it, i threw in 1/2 c. blended white beans to replace the margarine, and i liked it even better!